What say you to young Master Fenton? he capers, he dances, he has eyes of youth, he writes verses, he speaks holiday, he smells April and May: he will carry't, he will carry't; 'tis in his buttons; he will carry't. Not by my consent, I promise you. The gentleman is of no having: he kept company with the wild prince and Poins; he is of too high a region; he knows too much. No, he shall not knit a knot in his fortunes with the finger of my substance: if he take her, let him take her simply; the wealth I have waits on my consent, and my consent goes not that way. The wild prince is Hal/Henry V; Poins is one of the drunken thieves who hangs out with him and Falstaff. As a good middle-class dad, Mr. Page is very responsibly trying to keep his daughter away from such young rakes. I should love thee but as a property. May be he tells you true. That now I aim at. 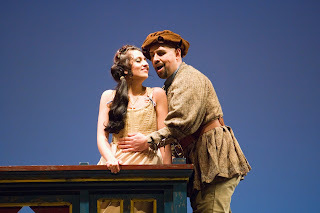 Marcus Shelton as Fenton wooed Ani Maldjian's Nannetta in Seattle Opera's 2007 Young Artists Program Falstaff. 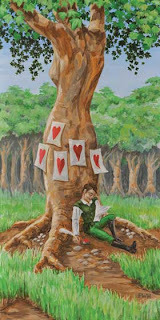 In the opera, Verdi and Boito invent a little routine for Fenton and Nannetta, a call-and-response “our song” they sing three times, as a code to declare their love to each other; and they also invent a marvelous scene for Fenton, wandering around in the woods in the middle of the night, improvising a metaphysical love poem. Anzi rinnova, come fa la luna. Like most idioms, this saying is almost untranslatable; it vaguely means that virginity and sexual attractiveness wane and then wax like the moon. Blagoj Nacoski, who plays Fenton at Seattle Opera, conjectures that perhaps Fenton gave Nannetta a copy of the Decameron, that they first kissed when reading this particular line, and that they keep singing this passage because neither can wait to take it past kissing to the next level. But, as both of them are about 15 years old, their breathless innocence is part of their charm. Che gli risponde colla sua parola. Come altra voce al suo fonte rivola. Tende sempre ad unir chi lo disuna. Così baciai la disiata bocca! Ma il canto muor nel bacio che lo tocca. hoping to drink deep in delight. finds thirsty lips who sing along. their chords are codes which secrets say. the singers look their loves upon. four separate lips at last unite. Thus lips’ thirst is quenched with a kiss. But song falls silent when lips drink this.